The Oxymizer® is the simplest conserving device available today, operating without electronics, batteries or flow controls. Development of this model of the Oxymizer® draws on over 30 years of research, development, and industry experience. 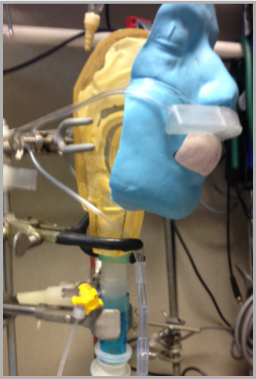 The design of the Oxymizer® provides a more comfortable alternative to high LPM cannulas or non-rebreather masks. Further, it facilitates continued oxygen therapy while patients eat, drink and speak in an unobstructed manner, thereby reducing patient anxiety and the risk of desaturation. The Oxymizer® has been historically effective at oxygenating hard-to-saturate patients, including some with refractory hypoxemia. 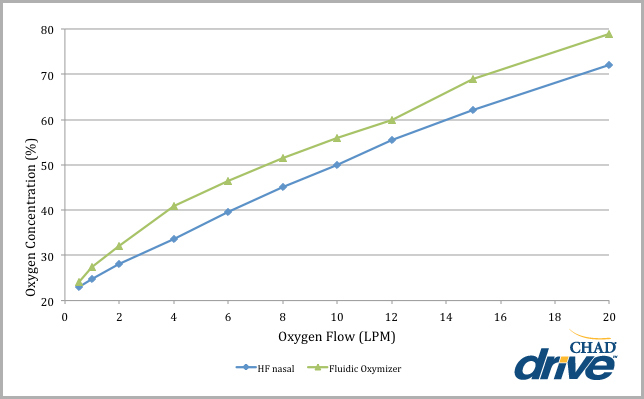 As illustrated below, the oxygen concentration of the bolus delivered from the Fluidic Oxymizer® is higher at every liter per minute setting, as compared to a high flow nasal cannula. During testing, FiO2 was measured at the trachea of a head extension model of a mechanical lung with an I:E ratio of 1:1, 16.5 BPM, and tidal volume of 500 ml. Please note actual FiO2 will vary with rate and depth of breath. The tracheal oxygen concentration study was performed with a face and nose model, calibrated oxygen analyzer with probe, calibrated mechanical syringe, oxygen cylinder with regulator calibrated to 15 LPM, PowerLab and LabChart electronic physiological recorder, and Excel and PowerPoint software. The oxygen analyzer probe was inserted into a port in the trachea of the anatomically proportioned model (Figure 1). Oxygen was delivered at flows ranging from 1-15 LPM with the lung simulator cycling at 16.5 breaths per minute. The output of the oxygen analyzer was connected with the input of the ADInstruments PowerLab running LabChart software. The entire measurement was taken twice. The expectation is that the oxygen concentrations in the trachea would increase both during low flow (<8 LPM) as well as high flow (>8 LPM). Additionally, transitions from low flow to high flow were expected to be seamless. It was further anticipated that the high flow setting could deliver oxygen concentrations similar to those expected from a non-rebreather mask. The Fluidic Oxymizer cycles well up to 12 LPM as measured by the oxygen analyzer probe situated in the reservoir housing near the exhaust ports. At 15 LPM the supply oxygen overwhelms the exhaust port region rendering cycling difficult to measure at that location since it is sensing high oxygen concentrations. However, when placed in the naris, cycling can be detected. 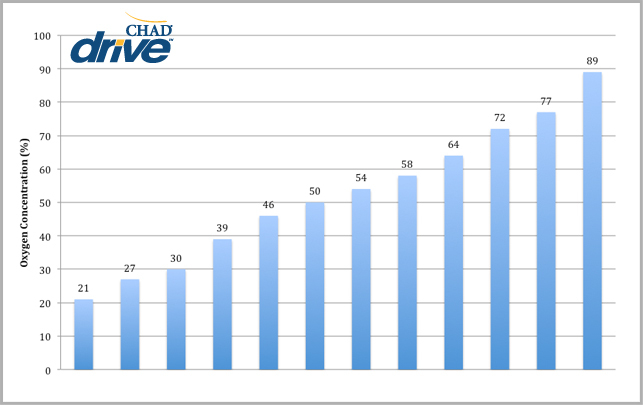 The tracheal concentrations rise steadily with increasing oxygen supply flows. 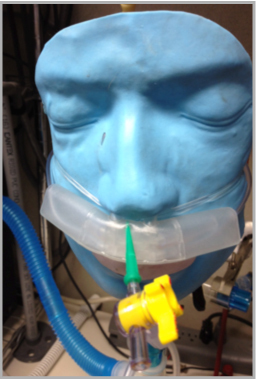 At 15 LPM the tracheal concentration is in the range of those measured with the non-rebreather mask. This is a similar finding observed when working with patients who have a very high flow requirement. With a flow rate of 15 LPM combined with the fluidic reservoir, patients are able to receive equivalent oxygen therapy up to 20 LPM. When testing the cycling of the Oxymizer®, the oxygen analyzer probe was inserted into a hole poked through the reservoir housing near the exhaust ports. (Figure 2). Oxygen was delivered at flows ranging from 0.5-15 LPM with the lung simulator cycling at 16.5 breaths per minute. The output of the oxygen analyzer was connected with the input of the ADInstruments PowerLab running LabCharts software. The entire measurement was taken twice. The expectation is that inhalation brings room air to the oxygen analyzer probe while exhalation brings pure oxygen to the probe. Cycling is expected to produce large variations of oxygen concentration from room air to nearly 100%. It is realized that there will be some mixing with ambient air.